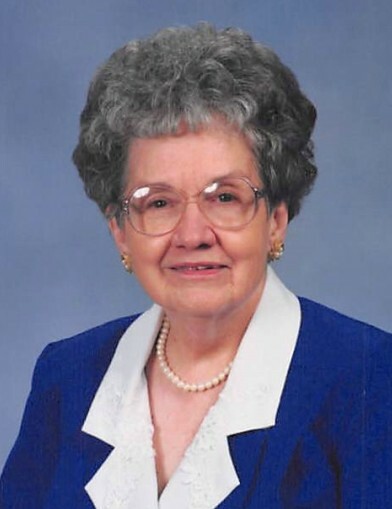 Margaret M. (Hudson) Hendren, 99, of Hannibal, MO passed away at 5:20 a.m. Thursday, November 15, 2018, at Luther Manor Retirement & Nursing Center in Hannibal. Funeral services will be 2:00 p.m. Tuesday, November 20, 2018, at the Smith Funeral Home & Chapel. Pastor Tom Day will officiate. Burial will be in the Grand View Burial Park. Visitation will be held 12:00 noon until the time of the service with a Beta Sigma Phi Ritual held at 1:45 p.m. Tuesday at the Smith Funeral Home & Chapel. Margaret was born on July 12, 1919 in Hannibal, MO the daughter of Rue Curtis and Gladys (Smith) Hudson. She was united in marriage to Hoyt L. Hendren on May 31, 1941, in Salem, MO. He preceded her in death on July 22, 1994. Survivors include sons, Ron Hendren and wife Fay of New London, MO and Gary Hendren and wife Janet of Cottleville, MO; sister, Marilyn Moore of Cornville, AZ; grandchildren, Brian Hendren of Lakeland, TN, Craig Hendren (Dianna) of Dardenne Prairie, MO, David Reilly (Dawn) of Milford CT, Heather Clemens (John) of Hannibal, MO, Derek Hendren (Nikki) of Vandalia, MO and Andrew Hendren (Elissa) of Columbia, MO, great grandchildren, Tommy Hendren, Nicki Hendren, Natalie Hendren, Mackenna Clemens, Evan Clemens, Ty Evans, Ryan Kraft and Mallory Kraft; and several nieces and nephews. In addition to parents and husband, Mrs. Hendren was preceded in death by two sisters, Louise Hudson and Lorraine Wigger. Margaret previously worked as a Senior Service Representative for Prudential for twenty-two years, she later volunteered through RSVP at the Hannibal Convention & Visitors Bureau where she received the Presidential Volunteer Award before she retired at the age of 90. Mrs. Hendren was an active member of Calvary Baptist Church where in her younger years she sang in the choir and the quartet. Margaret was also very active in the Beta Sigma Phi Sorority. During her free time, Margaret enjoyed shopping, eating out, reading her Bible daily, and the simple things in life like, crossword puzzles with a pen and playing a tense game of Scrabble with her family. Margaret’s biggest love was her family, especially at Christmas when she was able to visit with all her grandchildren and great grandchildren. Pallbearers will be Brian Hendren, Craig Hendren, David Reilly, Derek Hendren, Andrew Hendren and Tommy Hendren. Honorary Pallbearers will be Heather Clemens, Nicki Hendren, Mackenna Clemens, Evan Clemens, Ty Evans, Natalie Hendren, Ryan Kraft, Mallory Kraft, and special grandmother Margaret of Ben Rule, Matt Rule, Erin Rubemeyer, Cody Rubemeyer, Jr. Rule, Nick Rule, Vada Rule, Ashton Rule, Leland Rule, Wyatt Rule and Layla Rule. Memorial contributions may be made to the Shiloh Christian Children’s Ranch, Luther Manor Retirement & Nursing Center or Donor’s Choice, in care of the Smith Funeral Home & Chapel.